Do you know how your metabolism works? Get a better understanding of your energy balance so you could change your eating habits! Manual calorie counting by mobile applications are a thing of the past - GoBe2 counts calorie intake automatically! Emotions are an integral part of your life. Learn how to understand them. Drink Enough Water! It is essential to a well-balanced mind & body, and great for weight loss. Achieve Your Weight Loss Goals with these Amazing Features! Get automatic energy balance tracking! GoBe 2 calculates the number of calories you consume in comparison to the number of calories you burn. See your data in the Healbe GoBe App and on display in real time. GoBe 2 lets you easily see if you’re consuming more calories than you burn, so you can stay on top of your weight loss goals. Sticking to a negative balance for a longer time-period, will help to lose weight. 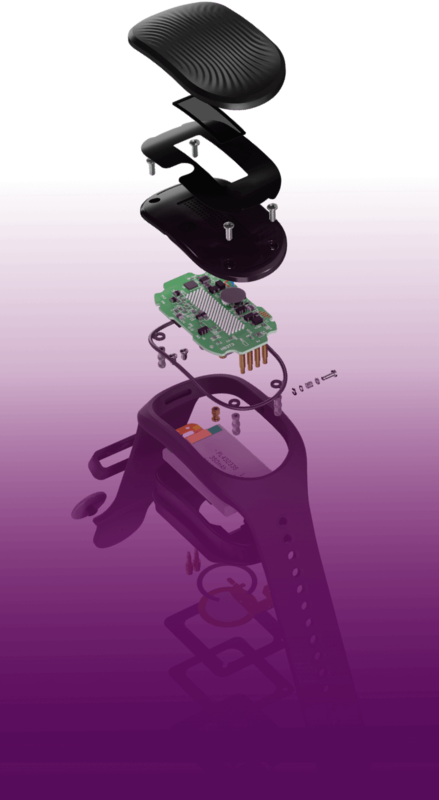 Healbe’s patented FLOW Technology™ automatically measures the number of calories your body consumes. It excluding the need for manual logging, error-prone guesswork, or the reading of Nutrition Facts labels. Healbe GoBe 2 counts calories for you – helping you know how much energy you get out of food you eat. GoBe 2 automatically determines your activity levels and combines it with your heart rate data to accurately track how many calories you burn throughout the day. GoBe 2 measures calories burned during any physical activity from the digestion process to maintaining basic body functions. 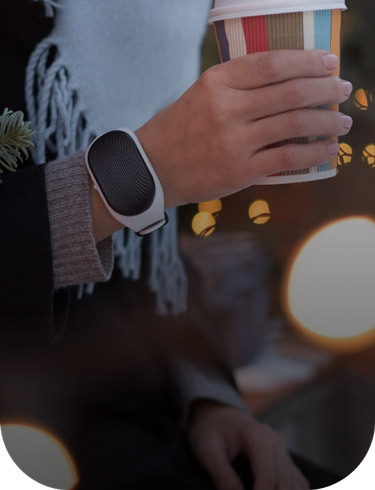 GoBe 2 is the only wellness band that can automatically track your water consumption and can remind you to drink more if you’re running low. Drinking enough water is essential to a well-balanced, mind & body. GoBe 2 combines motion and heart rate data to analyze your sleep patterns, duration, and quality and you can set a smart alarm to wake up feeling your best - the better you sleep, the better your body recovers and the faster the weight loss process goes. The smart alarm will make your morning wake-ups easier and smoother! GoBe 2 measures your resting heart rate and pulse during physical activity automatically and constantly while you are wearing the device. It delivers updated measurements every 10 seconds and helps you evaluate your lifestyle and maximize your workouts. GoBe 2 monitors physiological signals in real time. It incorporates a ‘Galvanic Skin Response Sensor’ which is used to detect changes in your skin, like sweat or perspiration. It can indicate when you feel stress, anxiety or detect emotions like happiness, anger or even mental stress that comes from a heavy workload. GoBe 2 enables you to better understand your emotional state, and can help you manage your stress and anxiety, leading to a more mindfully, healthy lifestyle. Emotions are extremely complex. Having a wearable device that can help you monitor your emotional state and in turn help you manage your daily stress is a revolutionary feature. GoBe2 enables you to better understand your emotional state, and can help you manage your stress and anxiety, leading to better habits like curbing those late night cravings. Understanding pinpoint triggers what causes your stress is an excellent place to start. Start managing your stress with GoBe2 today. 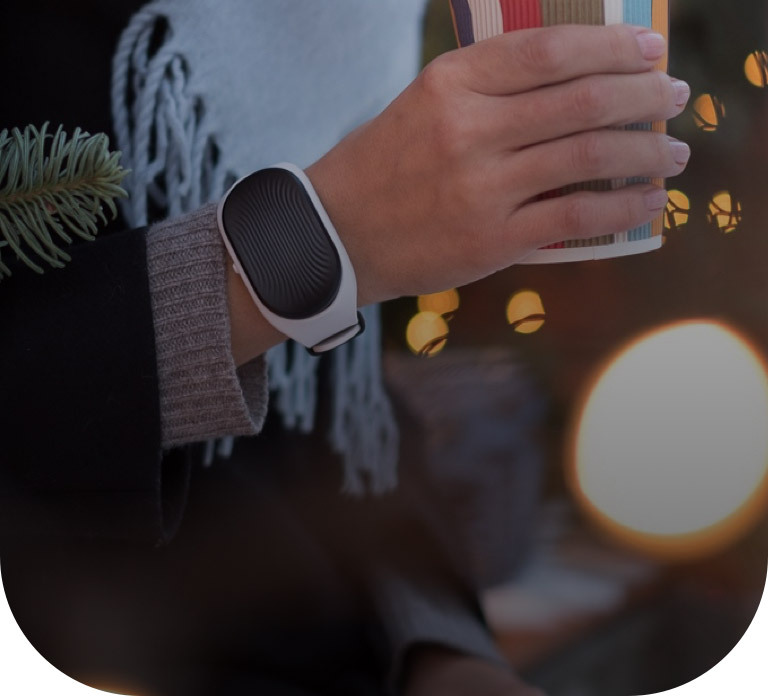 GoBe 2 tracks your steps with an accelerometer, which measures body movement and activity. GoBe 2 counts your walking and running steps and the distance of those steps by multiplying your step length (from toe to toe) The default step length is set to an estimate based on your height and calculations that take place from your activity. Calorie Intake Automatic Tracking People are different, and their bodies also absorb calories differently. Nutrition Facts labels do not always tell the same story when it comes to weight loss, and manual calorie counting by tables or mobile applications are a thing of the past. Go Be 2 analyzes data in ‘real time’ enabling you to understand how your body reacts to the food you consume and helping you adjust your calories based on the facts. Automatic Burned Calories Tracking calories for each person is a unique process, so individual calculation of calories burned is as important as the individual measurement of consumed calories for your weight loss goal. GoBe 2 tracks the calories you burn as you burn them, which helps to create a better understanding of how best to manage your weight loss. Energy Balance Keeping an energy balance is a crucial part of getting through the day. People absorb calories differently and maintain energy in different ways. Understanding how different foods react with your body is a crucial step in managing your energy level. Relying on the data is the best way to balance your energy and have the best day possible. Emotional State Emotions are extremely complex. Having a wearable device that can help you monitor your emotional state and in turn help you manage your daily stress is a revolutionary feature. GoBe 2 enables you to better understand your emotional state, and can help you manage your stress and anxiety, leading to better habits like curbing those late night cravings. Water Balance It is very important to keep your body hydrated. Water balance keeps your throat and lips moist and prevents your mouth from feeling dry, promotes cardiovascular health, keeps your body cool, helps muscles and joints work better. Water keeps skin supple, and helps to cleanse your body — inside and out. Staying heathy means staying hydrated. You are what you drink.It is very important to keep your body hydrated. Water balance keeps your throat and lips moist and prevents your mouth from feeling dry, promotes cardiovascular health, keeps your body cool, helps muscles and joints work better. Water keeps skin supple, and helps to cleanse your body — inside and out. Staying heathy means staying hydrated. You are what you drink. Automatic Intake & Burned Calorie Tracking Eating regularly to keep your workouts energized is a great technique and so is counting calories as you go instead of reading labels. GoBe 2 tracks the calories you burn as you burn them, which helps to create a better understanding of how best to manage your weight loss and frees your hands for more important tasks, like lifting weights! Emotional State Living in balance is all about controlling our emotions, or at least understanding them a bit more. It is, of course, important to not underestimate how much our emotional state affects our wellbeing. A little more knowledge can go a long way. Sleep Quality Everyone knows that a good night sleep keeps us going – form the energy we need to go through our day to getting in that great workout. Sleep helps achieve results, and is important for your body to recover properly. GoBe 2 will wake up you up at the right time, making the start of your day smooth, and the rest of your day productive. Every new day begins from the bed. Heart Rate Getting a good workout is all about keeping your pace. Understanding your heart rate enables you to monitor your workouts so you can get the most out of your exercise. You can even do monitor your heart rate 24/7, even though your workout might not last that long, you know your heart will. Water Balance Exercising depletes the water level of our bodies. The GoBe 2 takes a calculated approach in monitoring your hydration levels, which is great when you are active. Refill your body at the right time, based on the data from your body, helps give you that competitive edge. The more you push your body the more water it requires and with the GoBe 2 you can know how to reach your peak performance. Automatic Intake & Burned Calorie Tracking Activity means more calories are needed to fuel your body. Knowing the right amount of fuel that gives you the energy you need, and what you can burn is what training is all about. GoBe 2 lest you trust calculate the number of calories that are ideal for you and your workouts. Knowing when to consume and when to burn. Sleep Quality You cannot compete if you do not get the rest your body needs. The GoBe 2 sleep monitoring system allows you to help your body recover smart for the next day of training waking you when it is the right time for you to perform at your best. 1After you eat, your body starts converting food into glucose. 2Insulin triggers your cells to absorb glucose and release water. 3The GoBe 2 measures these changes by sending high and low frequency signals through your tissue to determine the fluid volume of your cells. The FLOW™ Technology only uses your body’s own information to help you perform at your best. Healbe GoBe2 collects your body data and synchronizes it in the App. Please ensure your mobile device is up-to-date for the best Healbe™ GoBe™ experience! • When you sign up for a Healbe User Account, you are required to provide an email address and to create an account password (collectively the "Registration Information"). • You can add additional personal details to your User Account, such as height, weight, gender, age, and address. • When you elect to share data from your Healbe User Account with others, we collect the information you provide about those individuals such as their name and email address. 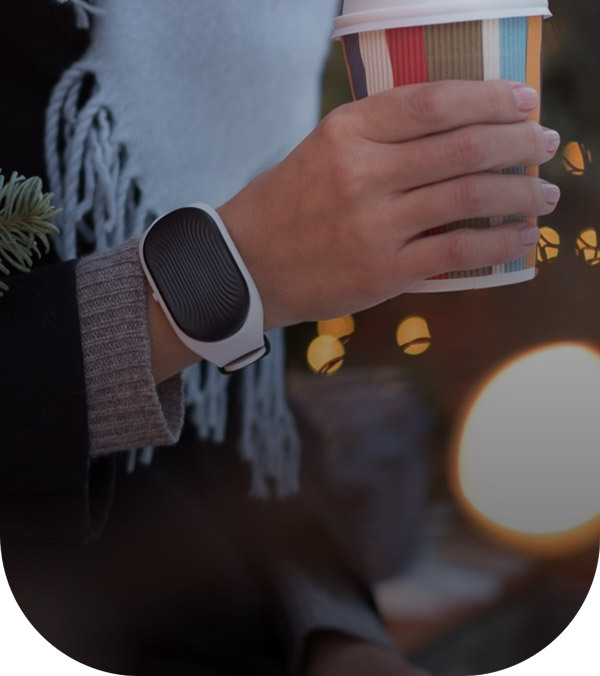 • When your Healbe Product is synched with your User Account, we collect information relating to your calorie intake, calories burned, heart rate, stress level, hydration levels, heart rate, pressure, and sleep status (the “Physical Information”), which is transmitted wirelessly from your Healbe Product to your User Account. • We collect industry standard log data about the browser and operating system you are using, the address of the external or internal page that referred you, your IP address at the time of account creation and keep a log of the pages that you visit on the Services in association with your IP address. We also collect the IP address associated with the device running the Healbe mobile application. • We collect location data provided by your mobile device. You must first enable location services when you download the Healbe mobile application or an updated version of the application. You can then turn location on and off within the application to activate optional features. You can opt-out of location services at any time. • Enforce the Healbe Terms of Service. In the event that Healbe intends to use your personal information for purposes other than those listed in this Policy, we will first notify you by e-mail at the address on file with us and/or post a notice of the changes on our Site. Healbe may also share your personal information with companies who provide services such as information processing, order fulfillment, product delivery, customer data management, customer research and the like. These companies are obligated to protect your information and may be located wherever Healbe does business. The Healbe Site and Service may use "cookies" and other technologies such as pixel tags and web beacons. Cookies are alphanumeric identifiers in the form of text files that are inserted and stored by your Web browser on your computer's hard drive. These technologies tell us which parts of our website you have visited, limit the number of times you see a Healbe offer, or help us better determine which Healbe offers you may like to see or to alert you to software compatibility issues. They are also used to analyze and improve our Service's design and functionality. "Web beacons" are images embedded in a Web page or email for the purpose of measuring and analyzing Site usage and activity. Healbe, or third party service providers acting on our behalf, may use Web beacons to help us analyze Site usage and improve the Service. • ApNexus -- The ApNexus Cookies page provides information about their cookie and gives you the option to opt out-of this program. • DetaXu -- The DetaXu Data Collection for our Platform page explains their privacy practices and gives you the option to opt-out of this program. If you would like to cancel your Healbe User Account you may do so by emailing our customer support at gobe@healbe.com. When you request cancellation of your account, your personally identifiable information will be deleted, including but not limited to your email address, name, photo(s), and links to social and partner sites. Archival copies of your account information that exist within our back-up system will be deleted in accordance with our normal back-up expiration schedule. Following cancellation or termination of your account, Healbe may continue to utilize de-identified and anonymized historical data associated with your use of the Healbe Products. (iii) How to Make a Claim. If the product fails to comply with this Limited Warranty, please contact us at gobe@healbe.com. Upon confirmation and approval of your warranty claim, we will, in our sole discretion, either replace, or refund the original purchase price. The purchaser will be responsible for, and will pre-pay, all return shipping charges and shall assume all risk of loss or damage to product while in transit to Healbe. (i) Customer Support. To get in touch with a member of our Customer Support team, please send a message to gobe@healbe.com. (d)	Other Jurisdictions. We make no representations that the Services, the Platform or the Website are appropriate or available for use in all locations. Those who access or use the Services, the Platform, or Website from jurisdictions prohibiting such use, do so at their own volition and are responsible for compliance with local law.